Fans of creepy crawlies will be right at home with Cashapillar. The game is a colourful look into the wilderness with a series of creatures lurking under every stone. The brilliant design has a really high end feel to it and we are expecting big things from this slot over the next few months. Microgaming has put on a 5 reel, 100 payline game which is actually one of their rarest combinations. This means that the maximum bet of 1,000 coins will target the higher rollers amongst you but you are still able to bet just 1 coin a spin if you so wish. The game includes a number of wilds, stacked wilds, scatters and a free spins game. The slot centers around beasties that are found in the undergrowth, like caterpillars, bee’s, snails and a host of other creatures. What we will say about the slot is that it’s been brilliantly designed and the gameplay runs as smooth as any; even the music is pleasant and not one you will have to mute after a few spins of the wheel. Probably the biggest pull to the Cashapillar slot is the two massive bonuses on offer of 6 million and 2 million coins respectively. To win both you will need to be betting the maximum amount as it works in conjunction with the gamble feature. The gamble feature allows you to gamble any winning line up the maximum jackpot amount. It’s a simple game where you guess if the next card is going to be red or black. If you are successful then you can carry on and cash out at any time. If you are unsuccessful at any time then all winnings will be lost. 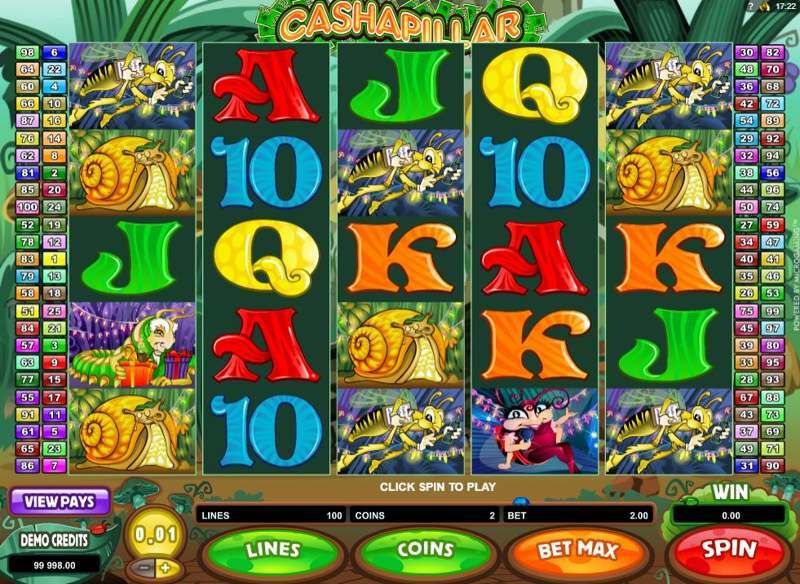 The 2 million coin jackpot can be won when using a winning payline in conjunction with any of the Cashapillar logo symbols, which serve as this slots wild symbols. These will substitute all symbols apart from the scatters and will pay double the winning payline. The wild symbol will also appear stacked on any reel, adding the possibilities of winning big and allowing you a shot at the potential 2 million coins. The free spins game is where you will get the chance to take down the 6 million coin jackpot. First off you need to get into the game, and to do this you need to collect three or more of the Bonus symbols with the birthday cake on. This will allow you to receive 15 free spins of which all spins are tripled. The use of the wild symbol to make a winning line in the free spins game will net you 6 times your original line bet. Free spins can be re-triggered from within the game.